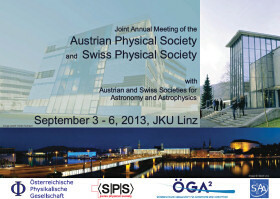 The 63rd Annual Meeting of the Austrian Physical Society will take place from Tuesday, September 03, to Friday, September 06, 2013, at the Johannes Kepler University Linz. The meeting will be jointly held by the Austrian and Swiss Physical Societies and the Austrian and Swiss Societies for Astronomy and Astrophysics. Its chief organizer is Prof. Dr. Armando Rastelli. For detailled information, registration and abstract submission please refer to the website of the meeting.